So far, international scientific experimental data prove that the loss of the energy generated by photovoltaic systems and is caused by dust, can vary from 1% to 80%!! For Mediterranean countries cleaning is recommended every one or two weeks!! The cost-side, if SolarSkin was installed at the 2 MW site, it adds up to an investment of €20,400 ($23,150) for a two-megawatt system or €0.0010/Wp ($0.0115/Wp). On top of that is the application of SolarSkin. This is a return of over 31,7% on the SolarSkin, without additional costs having been deducted on revenues. We emphasize that this benefit will arise only because of the lack of dust and various pollutants that settle on the modules. Reduction of labor costs per necessary cleaning. For Greece it is approximately 3,0-6,5 € / installed KWp. Reduction of cost and working time in case of required cleaning due to drought or precautionary cleaning. Relief from the income tax (> = 26%) for business, with the appearance of the purchase of the material as an expense. Reduction of high cleaning cost due to the increased risk (e.g. roofs, trackers). Saving of the energy lost during the cleanups where the facility, for security reasons, is turned off. Reduction of the financial and the environmental cost of the required water which can be increased if it is filtered (filtering, desalination, iron removal). In normal conditions, at a PV Park 4.95MW were required on average of 2.71 liters / module / cleaning. 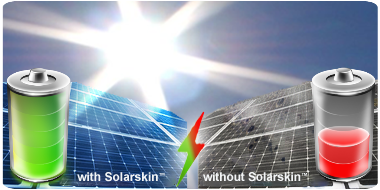 With the use of Solarskin™ in a period of two years were decreased to 0.728 liters / cleaning on average!! The improvement of the performance due to the recovery and prevention of wear of the glass surface of the module. Preventing of the premature wear of the cells in the interior of the module due to dirt accumulation to a point (hot spot)..
Time exposure of the PV modules to the morning humidity and snow is reduced.